Diggers Valley: 4 June 2016. The week beginning the 4th of June 2016. Our internet connection provides 30GB of data between midnight and 10am. Thanks to the Microsoft Windows 10 download scam, I therefore have to do all my on-line work first thing in the morning before the peak data time starts at 10am. You might gather that I'm pretty annoyed about this situation. Editing Jude's picture-heavy travel blog can use up quite a bit of data, as I reorganise its pictures into galleries and so on. It's fun though. I really enjoy seeing all the pictures, particularly of the children in so many different situations and Jude's writing is screamingly funny at times. After lunch we drove the 20 minutes over to Gaye and Brian's place to receive instructions for looking after their place while they're away on another fabulous holiday. 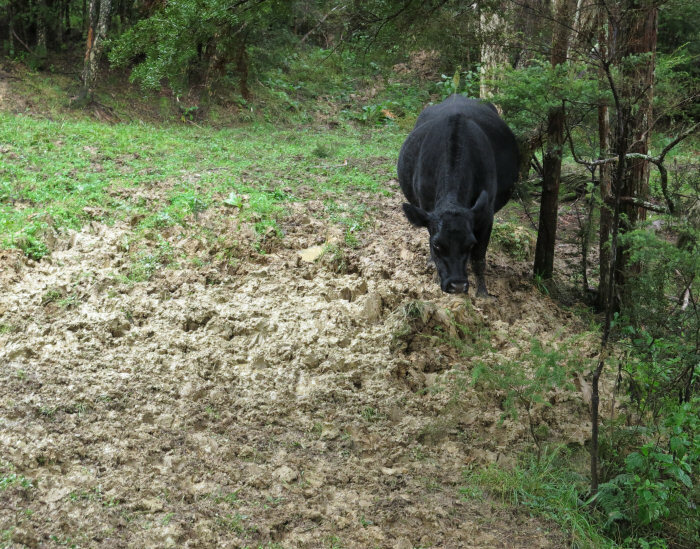 After we'd done that we beat a hastier retreat than I'd have liked as I suddenly realised it was getting on in the day and I'd left the cows a bit long in their current paddock. 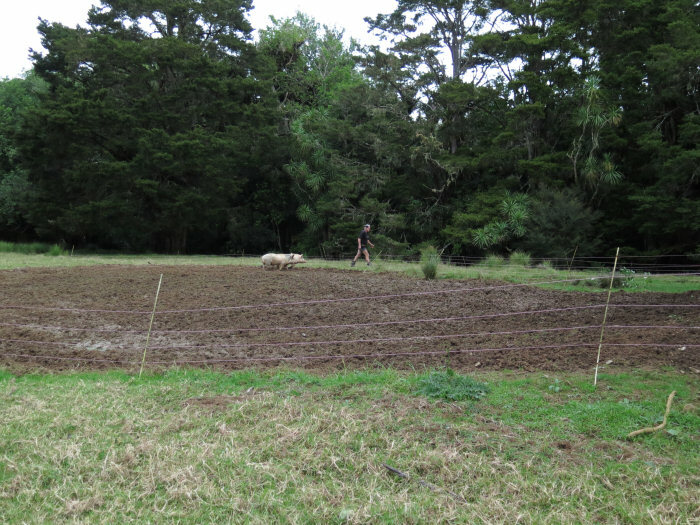 They had done a fairly good clean-up job in the Small Hill paddock and were keen to move. The photos often make them look a bit "ribby" but they're mostly in pretty good condition at the moment. In the foreground is 475, who's one of the older cows and always a bit on the light side. The left-most animal has two double chins! There's some serious fat in some places. 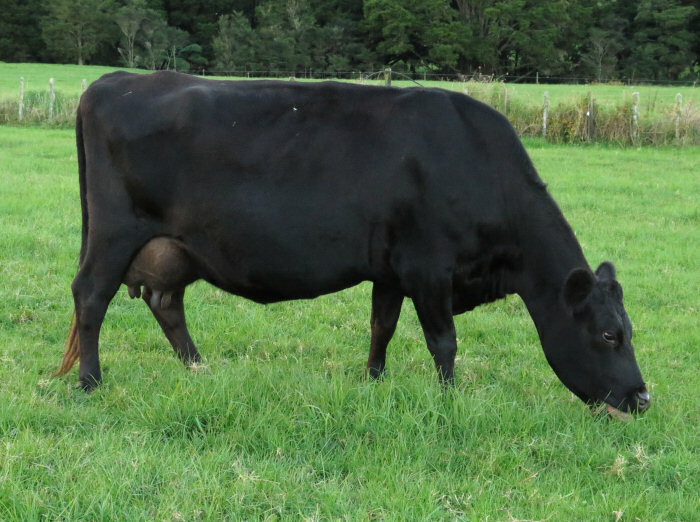 Zella's still looking pretty good too, producing a nearly-full 10 litre bucket of milk every morning and around seven in the evening, which goes straight to the pigs. We had a day of family visits today, starting with Amanda (Stephan's sister Rachel's lovely daughter) and then before she left, Elizabeth and William and clan arrived. 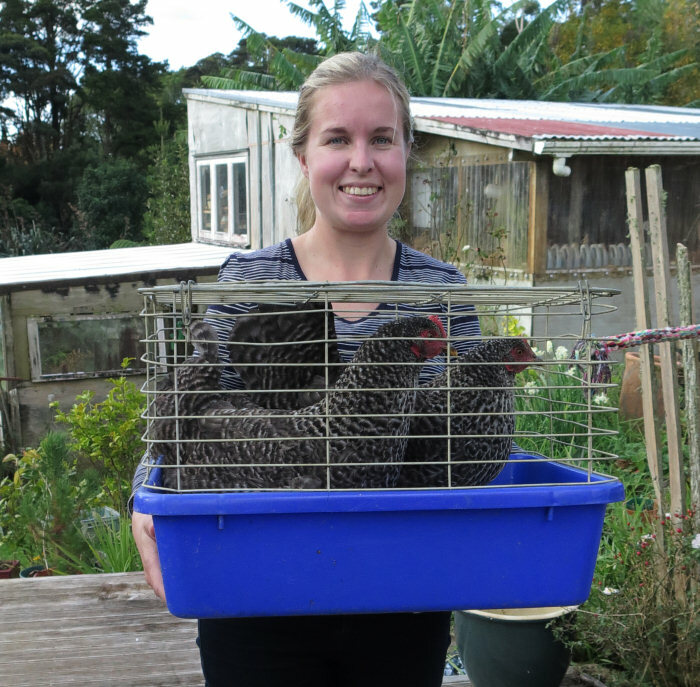 Anna and Simon took two of the young hens and a cage for them, in the back of their car, for installation in their Auckland garden. I feel rather attached to these hens, despite not spending a lot of time in their presence, I think because of the sadness of the drowning of two of their sisters. 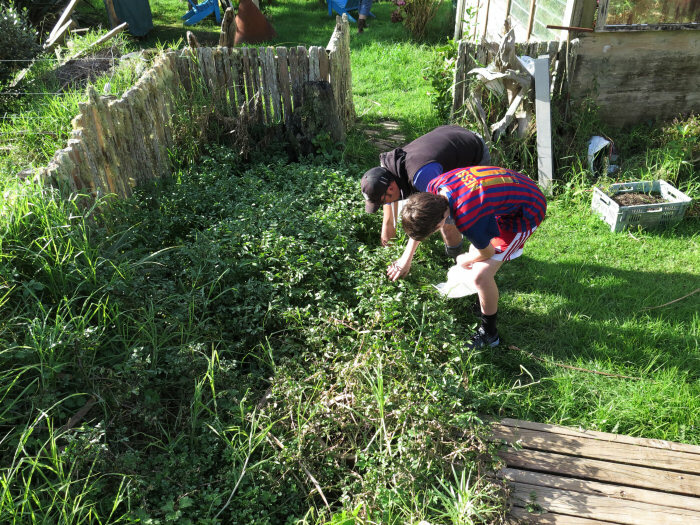 The watercress in our garden waterfall is lush and beautiful and just right for harvesting, which is what Karl very enthusiastically did, with some help from Ryan. Several bags full went into the back of his and Sarah's car to travel with them back to Auckland to share amongst the family. When everyone left, we went up to Brian's place to move some big steers which are due to go on a works truck in a couple of days. 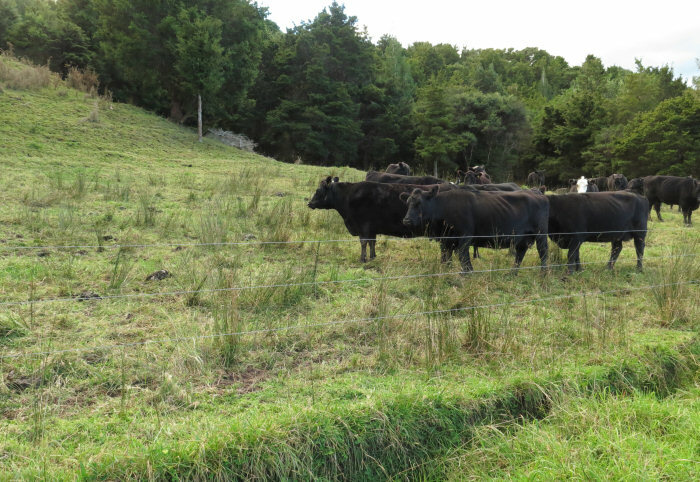 Cattle often behave very oddly with people they don't know and this lot all ran off in the wrong direction and we had to trick them into coming out the gate and on to their last paddock before they leave. Brian's stock agent will come and yard them for him, ready for the truck on Tuesday. 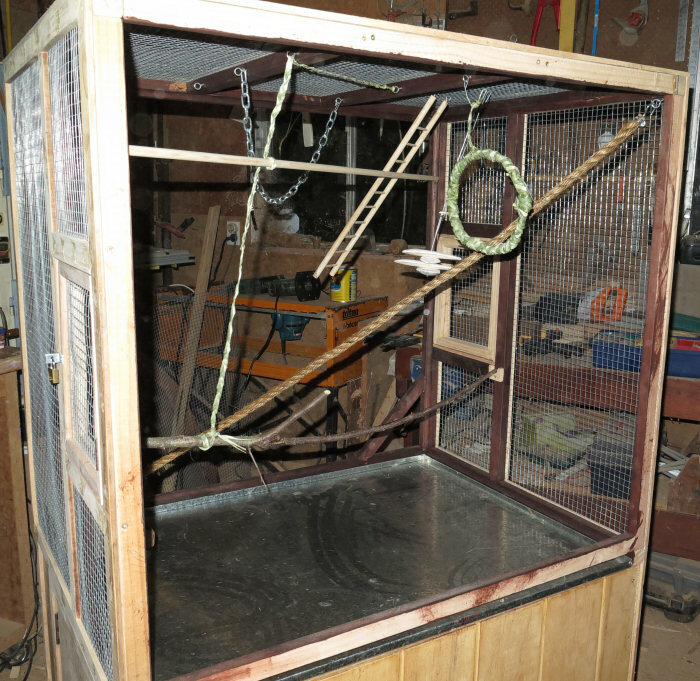 In the evening the budgie cage was ready to have its last netting put on and we decided it would be easiest to furnish it while the sides were still open. The rope has a couple of jubilee clips at the ends, tightened on hooks which allow it to be attached to eyelets screwed into the corners. 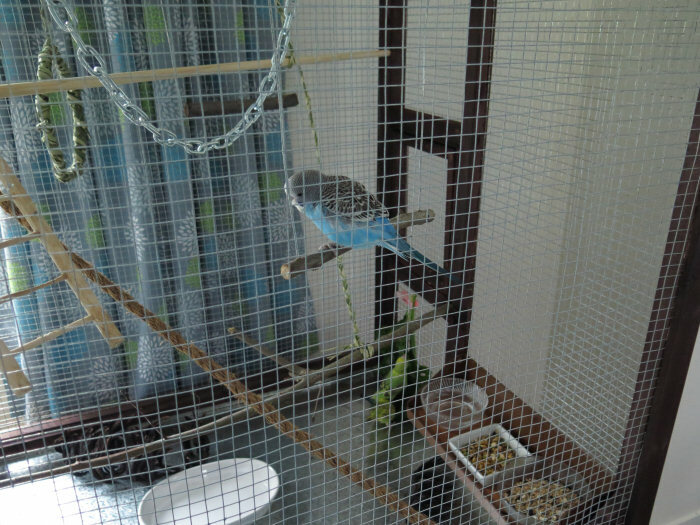 The three hand-reared budgies will be joined by the white budgie I've worried about for all the time he's lived here because he can't, for some reason, fly. He flaps his wings perfectly well but if he launches himself into the air, he plummets to the ground. In a big aviary with a concrete floor, that's not a recipe for a long and happy life. I hope the rope will provide him and his wing-clipped companions with a useful way of moving around their new space. We installed one solid dowelling perch, which they won't be able to destroy and the lower one is a piece of the Sebastian apple tree, which they'll probably chew very happily. I make flax rings for the budgies to sit in and chew on and they seem to like them very much. Still going ... 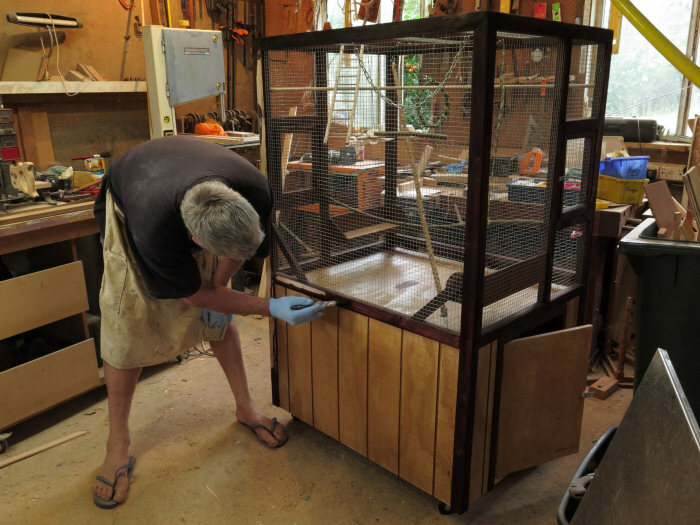 Onto the final touches now, some stain for the framing timber and as soon as that was done we moved all the birds out of the living room, lit the fire and cranked it up to produce as much heat as possible and wheeled the new cage inside to stand in the warm, dry air for a while. I hoped the heat would evaporate some of the stain smell a bit faster than would happen in the ordinary air temperature, for the sake of the human residents of the Switzer home but as much because I worried the fumes might make the birds ill. 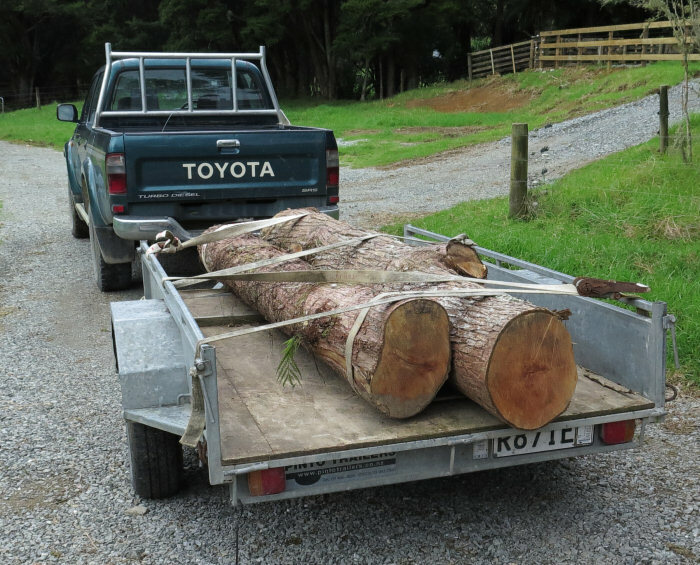 These are a couple of bits of Totara from the big trees Stephan had to fell to put the track through to the Middle Back. He's been talking about taking them to Oscar's mill since before he cut them down! Meanwhile I went off out the back to check and move cattle. I walked across the Bush Flat and looked into the reserve and spotted these interesting leaves. 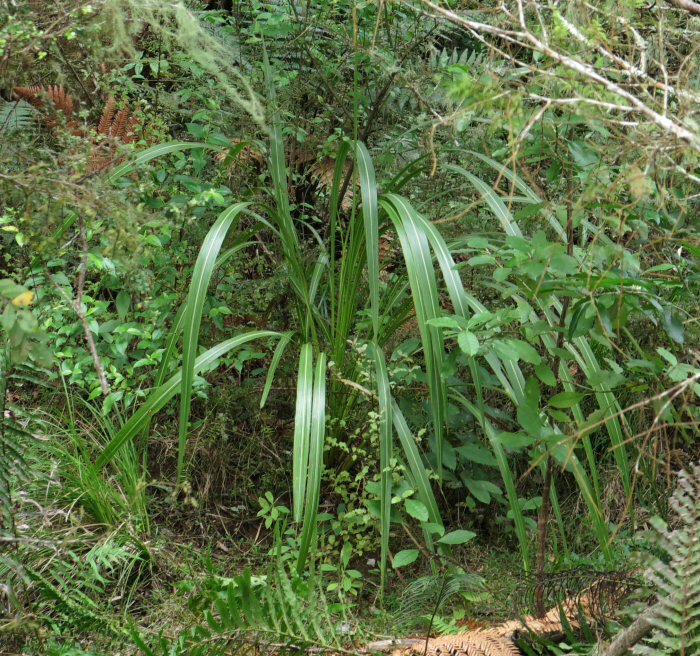 I am fairly sure this (and another two or three similar plants) are Ti Ngahere, the forest Cabbage Tree, Cordyline banksii. I don't see very many of them around but there are a few up and down the valley road, with their longer, wider leaves than T&imacr; K&omacr;uka, the ordinary Cabbage Tree. 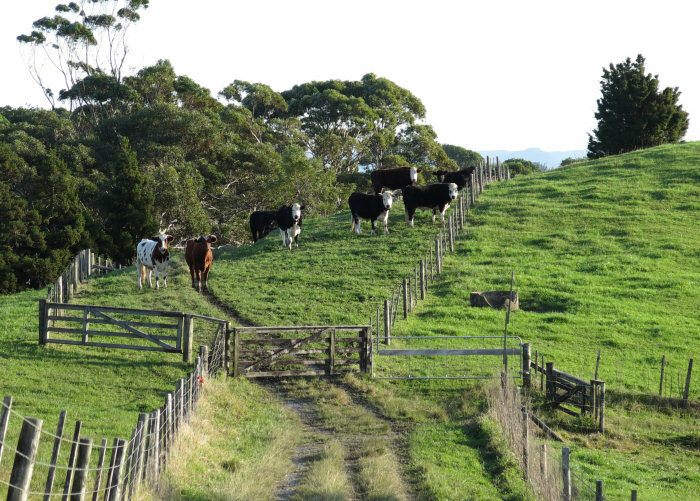 I walked the cows from the Big Back South around to the Spring Paddock (oh lovely lanes) and then the bulls from Mushroom 3 to the Back Barn, where Mr 87 immediately set off to explore the boundary of his new territory and work out how close he could get to his cow neighbours. 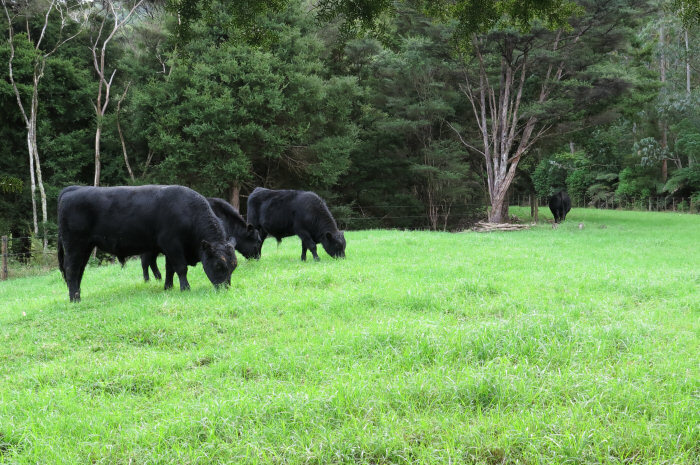 The young bulls all put their heads down and ate the fresh grass. Stephan had left the gate between the Middle Back and the PW open for the heifers last week and I went up to shut it so the cows can go next into the Middle Back. It's a long time since I wandered through the reserve at the top of the hill between the two paddocks so did so now. I think this is an extremely attractive fern, although having not taken any pictures of the arrangement of the spores on the undersides of the leaves, I can't yet identify it. 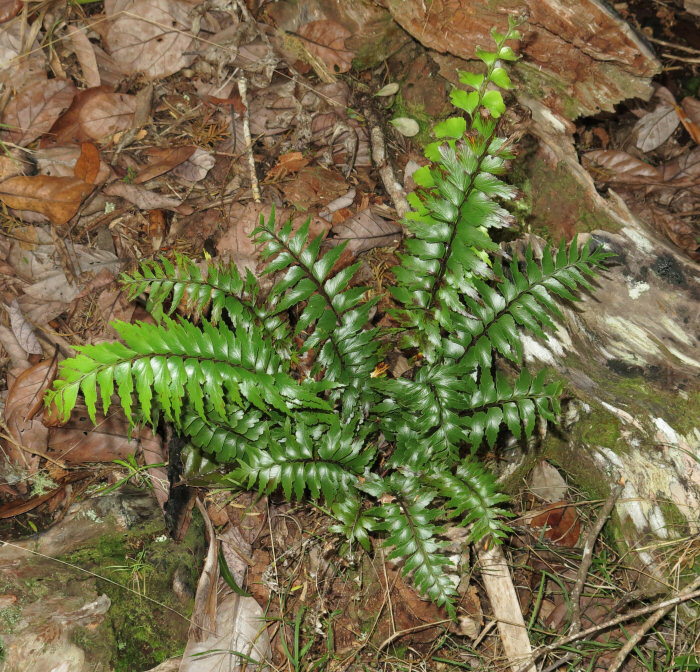 Thank you to Gary Bramley who identified it as Asplenium polyodon, a usually epiphytic fern common in our Puriri trees. 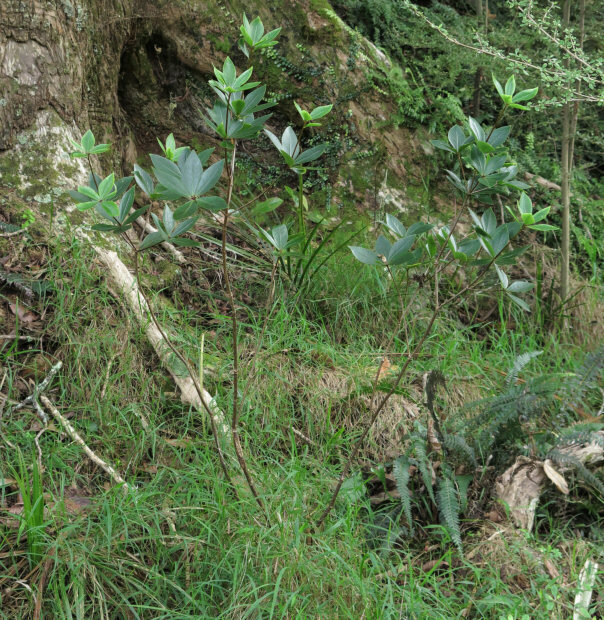 This is the usually-epiphytic Pittosporum cornifolium, which I found in February 2013. It doesn't look likely to become a very large plant but looks healthy enough, despite some cicada damage to various parts of its stems. 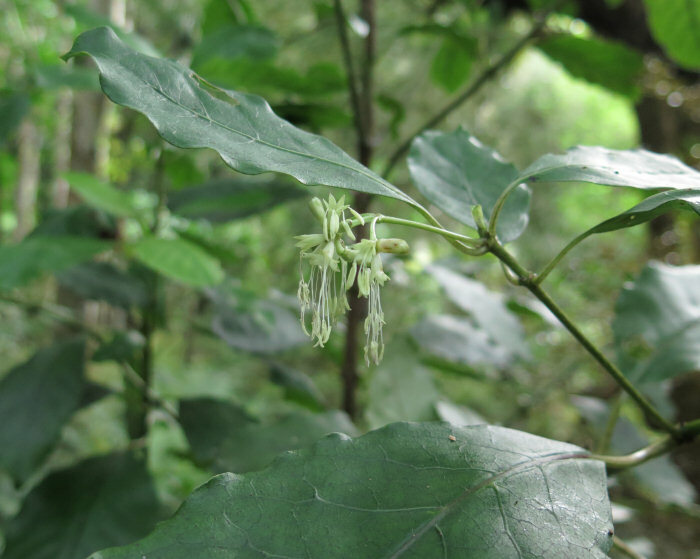 This is Kohekohe, Dysoxylum spectabile, about to begin flowering. 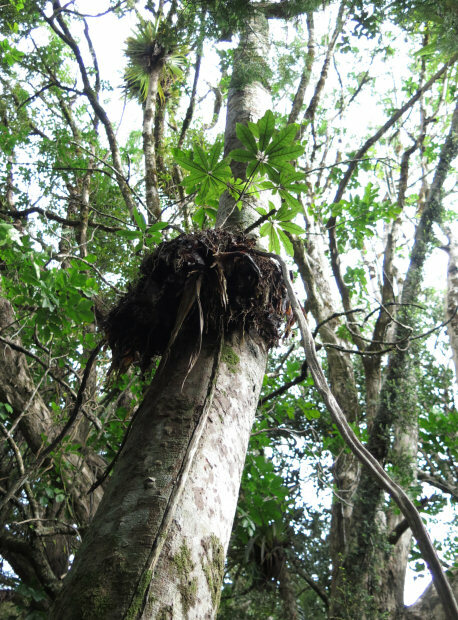 Its flower stems grow directly from its trunk and branches. 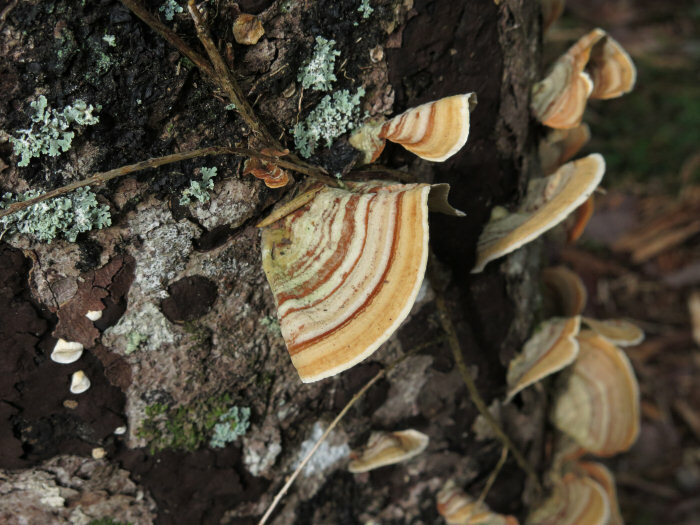 This very pretty fungus is growing all around the place, on dead trunks both still standing and fallen. 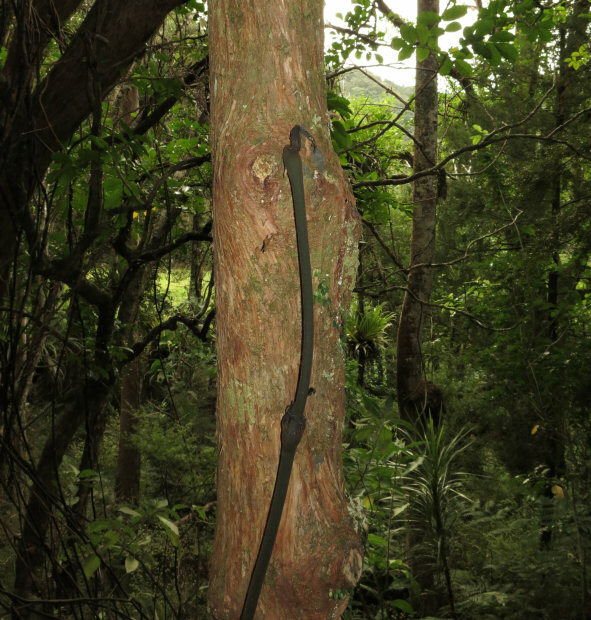 Here a Supplejack vine growing up a Totara tree, after snaking along the ground from its base. When new like this they feel beautifully soft and fuzzy. I looked at one through my tiny magnifying glass and was surprised to find that the tiny brown hairs which cause it to feel that way, are not nearly as thickly growing as I expected. Mature vines are hard and smooth and often form great entwined hangings from the trees. I often see trees growing high up in other trees, where birds have dropped seeds and they've germinated amongst other epiphytes. This is Pate, Schefflera digitata, growing in the dead remains of one of the perching lilies. Presumably it will eventually become too heavy and fall to the ground where it could continue to grow. Male Kanono flowers, Coprosma grandifolia. The conditions were quite breezy and it was difficult to get a good photo, so I'll have to look for more on another occasion. There is a photograph of a plant with female flowers in 2013. 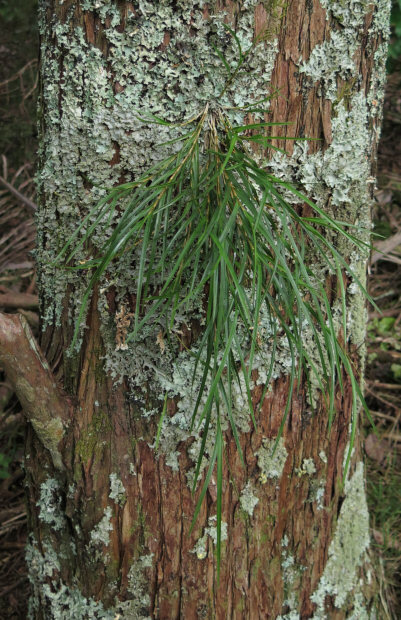 Peka-a-waka, Earina mucronata, grows all around the farm but I've not seen it like this before, growing on the vertical trunk of a Totara. 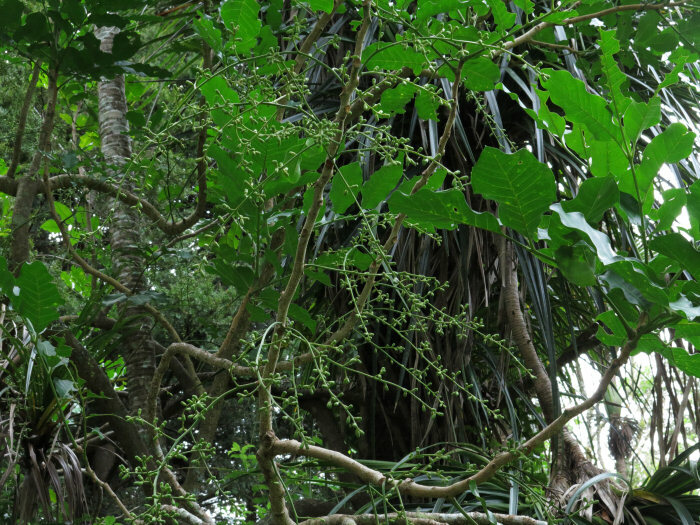 Usually I see it perched on horizontal Puriri branches. This morning we loaded the cage onto the back of the ute and travelled slowly to town (to avoid blowing everything inside it around too much). 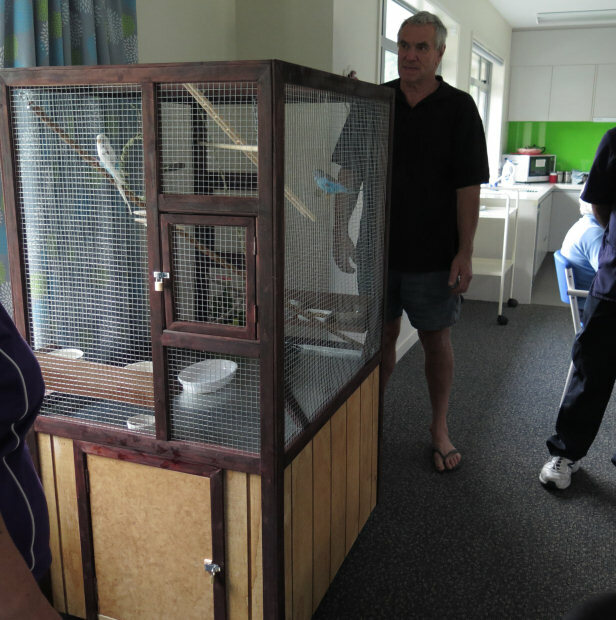 Putting it on solid castors was a very good move (haha), allowing us to wheel it along all the corridors and in to the Puriri Wing, the new secure unit in the Switzer home. I put the white bird in first and he went straight over to the rope and climbed up it. Excellent. I didn't ask anyone if I could include them in the pictures. It was all rather rushed and anti-climatic, there being only a few people we didn't know around. But the birds, with food and water added, seemed very happy with their new environment and so we left them there and went home again. At home, now we'd finished the budgie cage project, we could get on with the next thing which was to get the sheep organised for their jaunt to visit a ram. We only have four ewes left now and I do not wish to breed from the youngest, who was our last bottle-reared lamb. 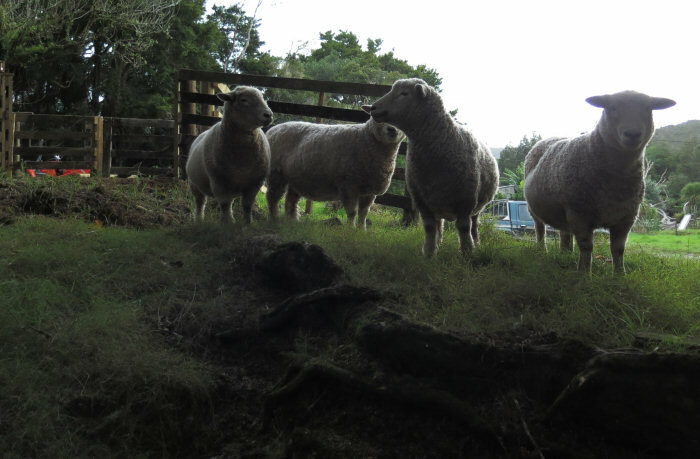 It has been so long since we had lambs that I'm having trouble tracking down who's who amongst the ewes. I know the oldest is Young Ewe who was the year-younger sister of Tag Ewe (the one who was so regularly cast and which we turned into sausages last year to prevent further problems). What I had forgotten though, was that those two were Dotty's daughters, from 2007 and 2008. The third ewe in the flock is Yvette's daughter, Jewedy (I'd forgotten that too, until I looked it up). Eventually I discovered a sheep reconciliation document in the accounts, which tells me the other ewe is Tag Ewe's daughter, although there's a hole in that history, caused by an accidental deletion, which I'll have to try and sort out. After three or four attempts, we eventually cornered the sheep where Stephan recently altered the yards to make a gateway where they naturally run to get away from us. Now we have no tame sheep, mustering them is not as easy as our old method of shaking some maize in a container and having them all follow wherever we want them. I took this photo as I was holding them, rather like an eye dog, with the ewes looking to make a break past me at any opportunity. We kept gentle pressure on until they eventually, one by one, turned and went in to the little yard. I told Leonie and Terry that I'd drench the ewes before they went to join their ram, so we did that and gave them a pedicure, so they'd be in their best state to meet their suitor. Then Stephan killed the youngest ewe and we pushed the other three up in to the shearing pen for the night, so they'd be nice and dry in the morning for their trip on the back of the ute. Stephan processed the slaughtered sheep by the light of a head-lamp before leaving her to hang from the tractor overnight for further processing in the morning. 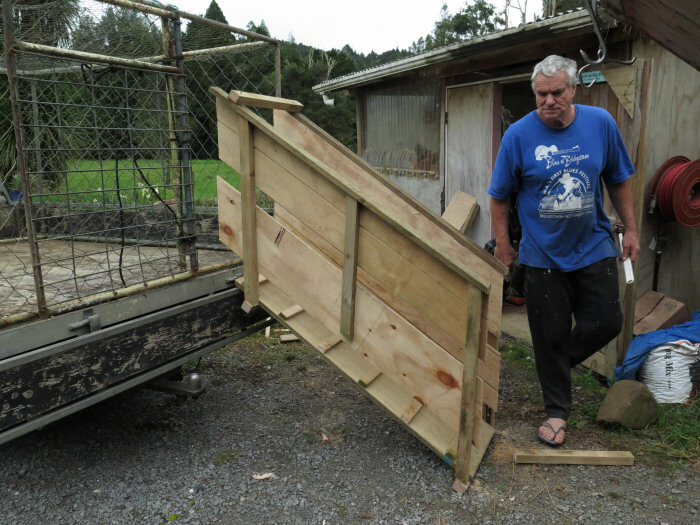 After cutting up the dead ewe and putting all the bits into the fridge, Stephan got on with finishing the ramp he'd started yesterday, necessary to load the sheep onto the back of the ute without lifting each of them up. 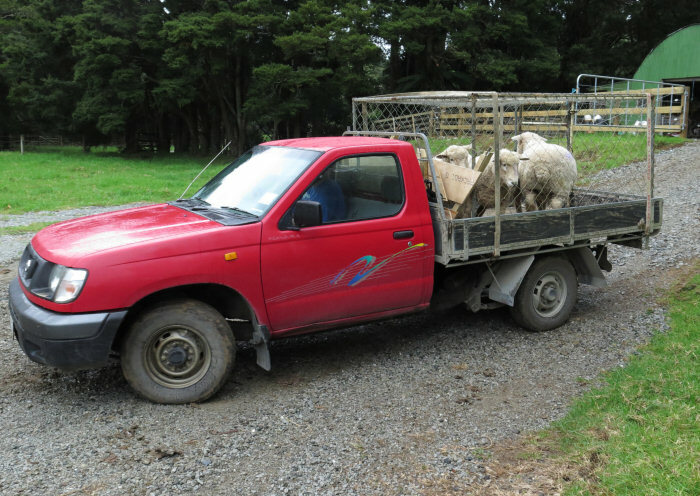 Then we lined the back of the ute up with the sheep pens and eventually got the sheep up the ramp and into the pen on the back of the ute. We drove down the valley, along Ruaroa Road to the main highway, along the main road for about 400 metres, then via Church Road (another unsealed, back road) across to the east coast Highway 10 and along another unsealed road to our destination. Taking back roads all the way meant we didn't have to travel very fast, so avoiding making the sheep too cold. While I wasn't looking, Stephan and Terry let the ewes off the back of the ute and they waited in a small paddock while we went and got the ram from his flock of pregnant companions. The ewes didn't seem too sure about the whole thing but the ram certainly knew what he was about! 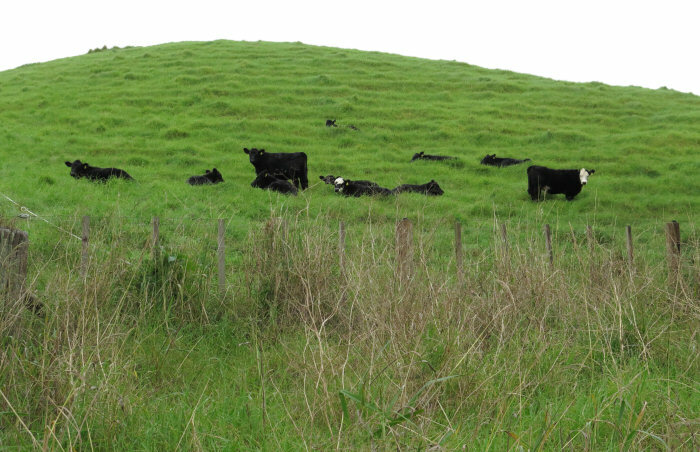 As we approached home we saw the calves all down in the corner of the one-third section of Over the Road, in so much grass some of them were almost invisible. I suspect they're pretty happy. Cows are funny sometimes. I'd only counted 34 through the gate behind me and was about to go off in search of whomever was missing when a moo and some galloping hoof beats announced the arrival of 729. I wonder what she was doing to have been left behind? She took a long time deciding whether it was worth her while to go through the mud to join the others and I had to go around behind her to make sure she did, before she decided against it and went off somewhere else! I spent an hour at the Switzer Home in town today, tending to the budgies. They have a care plan and a carer to ensure they're fed, watered and have a clean cage but Lesley and I have both said we'll call in and do some of that when we're in town. Everyone really likes the cage and having the birds in residence.